North Korean Nuclear Missiles Can Hit USA! OK, hold on, it’s only Guam (a US Pacific territory) that they can hit – so far. I know: that post-title was probably pretty cheap of me, and does no justice to the serious situation that is reported today by Germany’s Die Zeit. Because if they can hit Guam, they can also hit Alaska (I know, still no great loss, but bear with me here . . .) as well as Northern Australia and parts of India and Russia. (They’ve always been able to hit the People’s Republic of China and South Korea, but those are just a given, as respectively North Korea’s biggest ally and – ironically, bizarrely – its biggest enemy.) And I repeat that we are talking about nuclear warheads here. So you can see how the recent stop in Seoul by new American Secretary of State Hillary Clinton takes on a new after-the-fact significance after this discovery of what the North Korean are up to (which you have to presume that Clinton and other top officials were aware of at the time). For whatever reason, the degree of North Korean invective against South Korea has heated up tremendously in recent weeks, so much so that South Korean politicians are quoted in the Zeit article as speaking of a “war of words.” In reaction to which Clinton announced during her visit there: “North Korea will gain no other relations with the USA as long as it insults and refuses dialog with South Korea.” US and allied officials are concerned not only about the extended range of these new “Taeppodong-2” missiles but also about the prospect that they could find their way to other bad actors like Iran or Syria; the North Koreans have been known in the past as willing sharers of their deadly technology, if the price is right. News reports also noted how Clinton broke a “taboo” while visiting South Korea by openly speculating during an interview there over what’s happening with the North Korean leadership. For indeed, there seems to be something strange happening there, as the Zeit article describes. Some think dictator Kim Jong-Il might already be dead – for one thing, he didn’t bother to show up to the gala nation-wide celebration last week of his 67th birthday. In any event, his son and designated heir – named “Kim Jong-Un,” it seems – is preparing for his “coming out party” on March 8, which in North Korean dictator terms means taking up a position with the Supreme People’s Congress in preparation for the higher positions he is being groomed to take up later. You’ve heard by now of the kerfluffle over the cartoon published earlier this week by the New York Post (reproduced here for your convenience)? 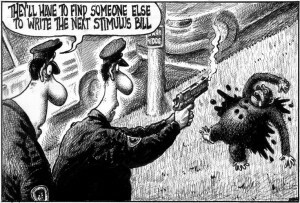 Although clearly inspired by the news story of a day before about how police in Connecticut had to shoot down a rampant chimpanzee, some prominent American public figures interpreted it as a reference to President Obama. Al Sharpton (of course) stepped up to call the drawing “troubling at best” and later, at a protest-rally, termed the Post “a racist rag sheet”; famed director Spike Lee announced his own boycott of the paper and called for others to join him. The Danish press picked up the story as well, or actually their common press agency Ritzau did, since an identically-worded piece ran in Berlingske Tidende and in the religious paper Kristeligt Dagblad. Their take? 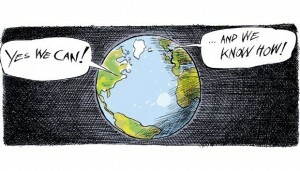 That the US now has its own cartoon crisis to deal with! That is even in the Berlingske Tidende headline: “USA gets its own cartoon-affair,” and the very first sentences (after the lede) in the common news-piece is “It is not directed against Muslims in this case, but against African-Americans. That is what angry black representatives say about a caricature-drawing that was carried yesterday in the tabloid-paper New York Post.” The article then just goes on first to describe the circumstances of the cartoon’s publication and then to list complaints against it along with an (abbreviated) response from Post editor-in-chief Col Allen. Of course, it’s actually doubtful that those “angry black representatives” really included in their statements any caveat about the cartoon not having anything to do with Muslims. Only in America? Actually, yes – at least something similar could never happen in Germany, as the article takes pains to point out at the end. Suleman was able to undertake her eight-baby feat in the first place because she had that number of embryos implanted at a Beverly Hills (of course!) clinic. However, “[i]n Germany such an intervention is forbidden. According to the German Law for the Protection of Embryos, a doctor can implant in a woman at most three Embryos per cycle.” And California authorities – if they’re still getting paid – are now investigating whether the doctor in question here violated his/her professional responsibilities. Here’s a headline from the French daily Libération that jumped out at me: Barbie, 50 years of a bimbo. All this is some serious commemoration for something/someone whom Libération is nonetheless willing to label in its headline a “bimbo.” Can someone help me out here – does that word in French lack the negative connotations with which we associate it in English? I wouldn’t really be surprised . . . The Secret of Happiness – Revealed! You can buy yourself a happier life – it’s merely a matter of using your money right, new research shows. So what’s the secret? Well, let’s get one thing straight first: this article is not about Ms. Søgaard’s ruminations on this subject, but rather her reporting on the research of psychology Professor Ryan Howell from San Francisco State University. Actually, let’s get two things straight: that old saw that money per se does not bring happiness is actually true, that is, you can be perfectly happy with less money. Right, right – so what’s the secret? Well, the key is “experiences, not possessions.” It’s not things that will make you happy; it’s experiences – like going to a play, eating at a restaurant, and travel, especially travel – that will do that, particularly when undertaken as a social activity together with family and/or friends. “Life-experiences namely provide a feeling of solidarity and of being alive,” Søgaard writes. They fulfill a person’s higher needs beyond the basics of food, shelter, and security – shades here of Maslow, although his name is nowhere explicitly mentioned – higher needs, however, which must be met for a person to count him/herself as truly happy. The point is stockpiling happy memories, which will stay with you for a long time (you “store” them, according to Prof. Howell), certainly for a longer time than the pleasure you derive from merely gaining possession of some new thing, no matter what it is (even your very own “McMansion,” I suppose). As for money, it is useful only as a means to gain these sorts of long-to-be-remembered experiences; any mistaken reverence money per se has gained for itself is a misunderstanding, as it is only good for that (and, of course, for handling those “lower” needs). So there you have it! Now that we have all seen the light, I look forward to running into you in short order somewhere in the Swiss Alps, joining me in some BASE jumping (that’s hurtling off of high cliffs with only a parachute). * By the way, I intend to inform Ms. Søgaard about this blog-post (as I usually do when the reporter’s e-mail address is made available; Danish papers are particularly good in this regard), and will add the recommendation that she officially change her name very, very slightly to “Yinni Yang Søgaard.” Besides being much cooler, that also seems to me the sort of name she should really carry if she intends to go around writing articles on deep questions of philosophy. UPDATE: Andrew Sullivan is a tad late, but offers here his own commentary on this study. Prince Harry, third-in-line to the British throne, is going back to school. His record of non-PC utterances that have escaped to public scrutiny has now lengthened to the point that a place has been hastily reserved for him in the British Army’s “Equality and Diversity” course, designed to instill in its students some sort of self-restraint for when they otherwise might be tempted to use insensitive language when referring to (or addressing directly, for that matter) minority groups. As you might expect, amused coverage of this latest stage in the young prince’s education can be found in a number of Europe’s on-line papers. I sort of like best, though, the treatment in the Czech Republic’s widest-circulation mainstream daily, Mladá fronta dnes (Prince Harry gains himself a behavior-course for his racist utterances). If you want to click on that link you can see one reason why right away: the photo there shows the prince on duty in Afghanistan, to be sure, but he’s revving through the desert on a motorcycle (wearing no helmet, naturally – but that’s just the old fart in me speaking), in front of two heavily-laden personnel-carriers and a couple of his soldier-mates who presumably must content themselves with such steerage-class transportation. Let me add now a couple more observations based upon having had the same sort of experience (i.e. deployed in wartime to the desert with armored vehicles) in my own life: what with the red coloring and what seems to be an abundance of other shiny metal, that motorcycle is for sure not “tactical,” i.e. does not belong in an environment where other people, somewhere out there, are authorized to shoot you and your companions if they can just find you, aim, and fire. Also, Harry lives fully up to his name (and I don’t mean “Windsor,” he’s not wearing a tie): the officer that I was back during my own desert deployment (1991) would immediately send him straight off to some sergeant to get a proper military haircut. For the record, EuroSavant is much more on Harry’s case for his evident tactical shortcomings, as newly-revealed in this Profimedia.cz photo, than his remarks, which actually seem a certain cut above what we were used to hearing from fellow British and American officers back-in-the-day. But he’s a royal, a British state employee of a very unique sort, so he can’t be allowed to talk like any other 24-year-old British Army officer would be naturally inclined to speak. Darn, I was enjoying this article from the Polish daily Rzeczpospolita on the recent messy collision, 805 km up in space, of an American communications satellite with a Soviet communications satellite (the latter presumably inactive; then again, we also are all forced to presume that they were innocuous, civilian-type satellites when the truth could be different). And I was seized with this powerful EuroSavant-type urge to just blast off and tell y’all alllll about it! But then I realized that the main source of information for the article was NASA. (Of course it would be NASA, who else? The Polish space agency? Jacek from Bialystok with the telescope set up in his backyard?) So why wouldn’t this news also be out already into the usual American channels? I had to go check this out with Google News, and of course it was. You’d be much better off reading the NYT piece by William J. Broad, so go there – it’s alright, just go. Still, at the time I checked that NYT article was listed by Google News as appearing only “1 hour ago”! Ah, don’t we just know the feeling . . . I picked up this story originally from the Dutch paper De Volkskrant (Rather in the cell than at home with spouse), but just a little work with Google News Italia brought me to an authentic Italian report of this case, with a bit more detail, in Il Messaggero (Better jail than wife. And he renounces house-arrest). The judge made a game attempt to convince the defendant of the merits of house-arrest, but quickly just gave in and let him serve his five months at the local prison. By the way, that facility is in Viterbo and is known as the Mammagialla prison. Mamma-GIAL-la!! – doesn’t that sound like it should be the name of a spaghetti or something? The little koala bear has become a symbol of the tragic fires in Australia. The entire continent has experienced the story of his rescue. The bewildered and heavily injured koala which emerged from the ashes of the Australian bush is only a small flash of hope after the days of devastation and the loss of more than 180 human lives. UPDATE: I should have known that that YouTube video with Sam the koala and fireman Dave would turn out to be a worldwide hit, so that you hardly need to go to Lidové noviny’s pages anymore to access it. I’ve already seen it, among other places, on the Washington Post’s website. The Danish daily Morgenavis-Jyllandsposten (famous for those “Danish cartoons” a few years back) and its Moscow correspondent Niels Jürgensen have what looks like to be an exclusive concerning an interesting slice of Cold War history: CIA stood behind Pasternak’s Nobel Prize. That would be the Nobel Prize for Literature for the year 1958, awarded to the Russian author Boris Pasternak basically on the strength of his magnum opus, the novel Doctor Zhivago. Tzipi Livni Wears the Pants! I wanted to pass along this remarkable photo that I spotted from an on-line article in the Dutch daily Trouw which merely reports that the Israelis are now having national elections, what the weather is like there for them, etc. 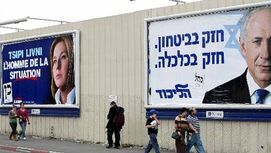 The scene is apparently in Israel, which of course makes sense for the display of election-billboards for both Kadima candidate (and current Israeli foreign minister, and woman) Tzipi Livni and Likud candidate Binyamin Netanyahu. Furthermore, it’s evident that Netanyahu’s billboard is in Hebrew, which also places the scene somewhere in Israel. I’d like to mention today this article I found on-line in the Danish Christian newspaper, Kristeligt Dagblad, entitled While we wait for catastrophe . . .
That’s right, after that attempt to find some humor last time – Somali piracy = “defense of food for Somali children,” ha-ha anybody? – we’re back now to some more doom-and-gloom. But at least this is unexpected and even interesting doom-and-gloom (I hope), for here the presumably Christian staff-writer for the Kristeligt Dagblad, Lars Henriksen, has a little surprise in store for us coming straight out of Heaven: an asteroid! Yes, adding to everything else we all have to worry about these days, this article discusses the prospect of the Earth being hit by a high-speed humongous rock from space. After all, this has happened before; some scientists now think such an impact, occurring about 65 million years ago, was what wiped out the dinosaurs as well as leaving a crater in Mexico 900 meters deep and 180 kilometers wide. It even happened again a little over 100 years ago, when Siberia was hit in 1908 by a 50-meter-wide asteroid which devastated 2,000 square kilometers of woodland. “Experts” quoted by Henriksen estimate that there is a 10% chance of something like that happening again within this century, and naturally there is no way to ensure that it would again occur in a relatively depopulated area. But there is also a silver-lining to report here, of a sort, namely that the University of Hawaii put into operation last December a new telescope designed to locate those asteroids in the Earth’s general neighborhood which are greater than a kilometer in diameter. (There are said to be about 1,000 of these; remember the devastation that that mere fifty-meter rock wrought in Siberia.) And it is now building a further three telescopes – cost: $100 million, but these days that doesn’t matter if it creates jobs – which, collectively with that first one, should be able to keep track of all but the very-smallest. By and large, the world was certainly glad to see the Bush administration out the door, but one particular population sub-cohort was not. (I mean besides Halliburton, Blackwater and their ilk.) Don’t tell me you don’t know who that was – it’s not as if political comedians’ grief over losing their best source of creative material was not covered extensively both in the on-line and the dead-tree press. I have good news for the yuk-meisters, though: while they and you and I recently had our attention occupied by the struggle to get the $900 billion stimulus bill through Congress (little prospect for laughs there), the African Union, at its summit in Addis Ababa, installed long-time Libyan strongman Muammar Kadhafi as its president for the next year! That’s at least a year of reprieve for you, guys! Enjoy! Where did Obama’s political “honeymoon” go? I guess it comes down to the times being a little too serious for cutting much slack to any new presidential administration, especially one coming into office with so much committment to “change” and so many electoral promises to keep. And keep them he had better, or the Flemings (that’s the Dutch-speaking Belgians) will let him know about it; already their main daily, De Standaard has the headline up Obama breaks first electoral promise. Now, to be sure, it does not seem to be the case that De Standaard has dispatched one or more of its reporters over to Washington to function as Flanders’ watchdog over the Obama administration for the rest of its term; newspapers around the world are trying to cut costs these days, not add to them. You’ve got to be smart in the news biz and get more out of less by leaning heavily on time-honored economic concepts like specialization and comparative advantage. So De Standaard relies mainly on the special website, called Politifact.com, that the St. Petersburg Times has set up to monitor (in great detail) Obama’s many electoral promises. Sure enough, there is already problem about the speed with which President Obama is signing newly-passed bills from Congress into law. It’s not that he’s too slow; it’s that he’s too fast, since his “Sunlight Before Signing” promise entailed putting each bill on-line for five days before signing it, “giving the American public an opportunity to review and comment on the White House website.” Yet the very first bill he signed into law, the “Lilly Ledbetter Pay Equity Bill,” was dispatched from the president’s desk a mere two days after the Senate passed it on to him, and in any case it does not seem that its text was put on-line even for that period. And then the next, the SCHIP bill extending children’s public health insurance, he signed into law a mere couple of hours after it was passed by the Congress. Here’s another entry in the series we seem to have fallen into lately of “Countries Tooting Their Own Horns.” We already have learned, from the Danish, that the Danish economy can be a “supermodel” for the rest of the world, and (from the Belgians) that Belgium is the most-globalized country. Now, as a current article in Die Welt puts it, Germany is the most-beloved state in the world! Ah yes, we know – those cuddly Germans! But wait: looking beyond the headline, what this is really all about is a worldwide poll, undertaken yearly for the BBC World Service by the firm GlobeScan, asking respondents to react to a list of fifteen prominent countries by stating whether, in each case, they feel that country has a positive or a negative influence on world affairs. This year, for the first time, Germany was tops, with 61% positive and only 15% negative. Canada was second (57/14), the UK was third (58/19). And the losers? In tenth place was China, at 39/40 – yes, despite those marvelous Summer Olympics. In eleventh place came the USA, with 43% evaluating its influence on world affairs as negative (40% positive). Keep in mind that this poll was conducted after Barack Obama was elected president last November 4 – but at least that negative rating for the Americans is down from the 48% that it was in last year’s poll. Then Russia at twelfth place (30/42). Israel is at fourteenth place (21/51), but at least the Jewish state beats out Pakistan (17/53). Zuroff indicates to his French interviewer his definite intention to travel to Cairo to examine the documents attesting to Heim’s death himself. But for now he believes (“according to our latest information”) that Heim may well still be alive, having absconded at some point to that more-traditional Nazi refuge, South America – although Zuroff also points out that Egypt actually was an even better place to hide after the war for Nazis on the run, one endorsed by Franz Stangl, commandant of the Treblinka death camp, who made that country his first stop on the run. UPDATE: An article in Le Monde now adds some further relevant details, mainly that German police now intend to travel to Egypt shortly to positively confirm Heim’s death by finding actual evidence, like the remains of a body. It also recounts how the Austrian authorities submitted in 1950 a detailed request to arrest Heim to the (then West-) German Ministry of Justice, even listing his exact location of residence within Germany. Heim was originally Austrian, you see, plus the outrages for which he was most infamous occurred at the Mauthausen concentration camp located within Austria. But that request was ignored by the West German authorities. Just as the Obama administration is getting prepared to ramp up US military strength in Afghanistan by about another 30,000 troops, a very real problem has arisen as to how to keep supplied the NATO troops already on the ground there, much less bring in brand new forces. The land supply-route from Pakistan via the Khyber Pass has lately become somewhat insecure and unreliable, but now the air route threatens to become much longer and more difficult due to the announced closure to NATO use, within six months, of the Manas airbase near the Kyrgyz capital Bishkek. The Washington Independent’s ace (US) national security reporter, Spencer Ackerman, now considers the Manas closing as inevitable, while Scott Horton over at Harper’s enlightens us as to the corrupt and high-handed (even deadly) American behavior there that caused relations with the Kyrgyz to sour to bring us to this point. The world-renowned French daily Le Monde provides yet more context for that Kyrgyz government decision (Five countries of the ex-USSR create a fund for dealing with the crisis). Those five countries are Russia herself, Belarus, Kazakhstan, Tajikistan and, yes, Kyrgyzstan, and the article shows clearly how Russia has succeeded in re-extending it’s influence over the Central Asian countries both financially and militarily. Sure, there is that $2 billion loan and $150 million in an outright grant reported by the New York Times that Russia has offered to Kyrgyzstan. But that august newspaper failed to report that Kyrgyz president Kurmanbek Bakiev travelled to Moscow in the first place to take part in a summit with Russian president Medvedev and the presidents of five other ex-Soviet states. It was there that the subset named above established a collective $10 billion fund (with a disproportionate Russian contribution, one would expect) as an emergency and stabilization reserve for confronting the worldwide financial crisis. But that same summit had an important military dimension as well. All seven of the presidents in attendance (i.e. the five listed above plus those of Armenia and Uzbekistan) agreed to create “collective armed forces” for responding to common external threats. And it was actually in connection with this summit meeting that Kyrgyz president Bakiev made his announcement that the Manas airbase would shortly be closed to the Americans. Although it is true that “collective armed forces” is a vague phrase, and that one should wait and see what comes of it in operational practice (if anything – it’s highly unlikely to mean a fusion of all those nations’ armies, for example), it is nonetheless clear that Russia’s influence in Central Asia is waxing. But it’s also probably useful to remember that American access to airbases in the region, starting in 2001 (i.e. less than ten years after these states had gained a sort of “independence” from Soviet Russia) was extraordinary to begin with, and really only due to the world political climate in the wake of the 9-11 attacks, which among other effects brought about toleration for this extraordinary concept from the Russian government. If that attitude cooled soon thereafter, it did so somewhat less quickly in the states actually hosting American bases, namely Uzbekistan (with an airbase made available until 2005) and Kyrgyzstan, giving them for a while at least a veneer of policy “independence” from Moscow. The impending loss of the Manas base, however – although considerably helped along by American behavior, as Scott Horton reminds us – was in this geopolitical context something inevitable, so that one would rather hope and expect that contingency plans for what to do next are already in place at the Pentagon.
. . . and millions of model-railroad friends grieve for the tradition-filled enterprise with cult-status. The majority-owner had announced a [financial] rescue not long ago. But now the firm has become a victim of the financial crisis, of management mistakes and of a societal shift. I also looked at reports of Märklin’s recent demise from various other German on-line publications, but the Spiegel’s account is the best because of the interesting background information that it provides. Like how about this: the announcement that the firm would have to file for bankruptcy from Märklin’s chief executive Dietmar Mundil came yesterday, just prior to the opening of the annual International Toy Fair convention in Nürnberg. And this was only shortly after the company’s marketing head, already present in Nürnberg for the convention, had issued a statement for the benefit of his fellow convention-goers (i.e. worldwide toy industry professionals) that there was no bankruptcy on the horizon for Märklin. Embarrassing, that, but maybe top management should not be blamed too much here, since it seems the bankruptcy was also a surprise for them, something that suddenly became unavoidable after the recent unexpected refusal by the company’s banks to roll over the €50 million in credit it had outstanding. Ah, but who was that management? Not the original families who had founded and built up this model-train manufacturing business over the course of 150 years (the Märklin family, yes, but also the Friz and Safft families); they sold out in 2006 to a consortium made up of Goldman Sachs and Kingsbridge Capital, a London-based private-equity firm. The company had been losing money since 2004, you see, and these new owners proceeded to do what such private-equity new owners do, namely make their new acquisition start producing profits again no matter what had to be broken in the process. Four hundred of the total 1,400 jobs were eliminated, along with two factories, toy retailers were instructed to pay their invoices more promptly, etc. But those new owners consortium also invested in developing the company and introduced imaginative new marketing wrinkles, such as model-train “starter sets” sold for €100 at the German low-cost supermarket chain Aldi, as well as the simple insistence that store-owners display the model trains more prominently. And indeed, turnover did rise through 2008, to €128 million by the end of the year, so that Kingsbridge head Matthias Hink could declare then that “Märklin is one of Germany’s best brands and has considerable potential,” and that they certainly never intended to sell it. From Kazim’s account, we probably need to take Hink at his word here; it does seem that the firm ultimately went under solely because it could not achieve a credit roll-over that would have been routine for it in normal times. Out of Track in the Long Run? On the other hand . . . maybe Märklin was actually doomed, sooner or later. Let’s face it: who plays with model trains these days? Kazim gets some interesting quotes on this subject from an expert, one Werner Lenzner, a toy-industry market researcher, who asserts that, starting in the 1980s, model trains were not for kids anymore but for adult collectors – typically male and between 40 and 60 years of age. The individual pieces were no longer relatively cheap toys meant to be kicked around; they had became expensive and were meant for display. This older cohort is now, in the first decade of the twenty-first century, to be found according to Lenzner “rather sit[ing] during their leisure time in front of the computer [ed. interjection: reading EuroSavant!] or at the fitness-center.” Lenzner is even willing to say for the record that those who still sit around building elaborate miniature train tableaus are now generally viewed as schräg – which my dictionary defines as “slanting, oblique” but I think we can figure out that term’s slang (and probably not so complimentary) meaning. Then again, what Matthias Hink from Kingsbridge said about the staying-power of the Märklin brand remains true, I think, and no brand really ever has to die unless for some reason it is explicitly put to death. Someone else will surely buy up that brand and the company’s other assets and carry on. Lenzner again: the main mistake was “to make very costly [train] models, in extreme detail, which only a well-to-do collector could afford.” So the new Märklin probably should go back to manufacturing true trains for the kids. Or maybe expand further the product-line to which it can apply its powerful brand: Märklin “train engineer” sunglasses, anyone? I know, you probably have enough on your plate as it is to worry about. And goodness knows, they now say this whole financial crisis thing is likely to drag on for a while, so that it’s highly likely that we’ll all need the 2012 European football championships – scheduled to be jointly hosted by Poland and the Ukraine – as some welcome distraction from our everyday cares and fears. Construction of new highways and expressways is bogging down again. There will not be routes to Euro 2012. Investment in roads won’t help to fight this crisis either, since there is simply too little of it. It was Polish Minister of Infrastructure Cezary Grabarczyk himself who promised a year ago that Poland intended to build 700 km of new highways and to expand its network of expressways by 2,100 km. However, reporter Andrzej Kublik concludes that that was an unrealistic goal from the very beginning, even as the current effort to build those new roads (as well as to modernize existing routes) represents the biggest such Polish infrastructure program in decades. While things got off to a promising start through 2007 – in terms of meeting intermediate construction quotas – that initial pace then became too difficult to maintain thereafter, even as the quotas were set much more ambitiously starting in 2008. An added element of confusion entered the picture as the government authorities decided to contract for some of the stretches of highway with a private firm, Gdansk Transport Company, rather than rely exclusively on the State highway-building company. (I’ll spare you the full name of the latter; from its initials it’s known as the GDDKiA.) There was a couple of untimely changes in the management of that state company; and other political considerations got involved. The upshot was a series of postponements of completion dates that now threatens to deny UEFA the functioning highway-net (especially between the cities staging the matches!) that it was promised when Poland won the Euro 2012 bid along with the Ukraine. A frank report like this from Gazeta Wyborcza is refreshing to see, but really, it needs somehow to feed through to UEFA officials. (One can also infer that extra scrutiny on their part of the extent to which the necessary infrastructure – stadiums, roads – is coming along in the Ukraine is warranted as well.) For rather than allow a hopelessly messed-up Euro 2012 tournament to be staged in the countries that agreed to do so but are not ready to ensure that it is a success, there has always existed and still exists the “pull the plug” option to simply re-assign the tournament to some other European country more ready to take over. I’m sure that Germany – to name but one candidate – is ready and able to take the task on. “Alright, but isn’t this the same country where no one wants to serve as prime minister?” you might be asking at this point, particularly if you followed along with coverage on this weblog last summer of yet another Belgian political crisis that unfortunately coincided with the National Holiday. And, of course, you’re right. So it is no surprise – even if it is kind of amusing – to see on the website of that very same newspaper, De Standaard, on the very same day a headline in English, “Something is rotten in the state of Belgium.” That fronts an article that is all about Belgian politician Bart De Wever and his dominant (in the Dutch-speaking part of the country, that is) N-VA or Nieuw-Vlaamse Alliantie party. De Wever tells reporter Peter De Lobel that 2008 was for his party “the year of the great disillusionment.” He laments that “this country doesn’t work any more,” and points out that the major Belgian bank KBC had to get a €2 billion bailout from the Flemish regional government a few weeks to avoid bankruptcy – the Belgian federal government was supposedly uninterested in helping out what De Wever claims it looked askance at as a “Flemish and Catholic” bank. That sort of squabbling over a major financial institution in trouble is a measure for you of how divided politics are in contemporary Belgium, no matter how “globalized” the country may be. fugleman – noun, plural -men. 1. (formerly) a soldier placed in front of a military company as a good model during training drills. 2. a person who heads a group. So I’m taking my usual stroll through my RSS reader . . . and what do I come across? Something from the Danish daily Berlingske Tidende, entitled The Danish supermodel! Hey, click on that sucker . . . ! You are currently browsing the EuroSavant weblog archives for February, 2009.